Horsetail is an ancient, nonflowering relative of the fern that grows on wet sand and is therefore very high in silicon. Some argue that the silicon in horsetail is inactive and not needed nor utilized by the human body. Herbalist Matthew Wood argues otherwise, “Horsetail has the ‘intelligence’ to deal with silica and share this ‘knowledge’ with the organism in need of the substance.” Many herbalists agree and find that it has a strengthening effect on weak hair and nails, connective tissues, toenail fungus and helps to bring foreign or dead substances to the surface of the body. It is a great ally for those wanting to strengthen their bones, especially combined with other mineral-rich herbs such as oatstraw, comfrey, nettles and red clover. 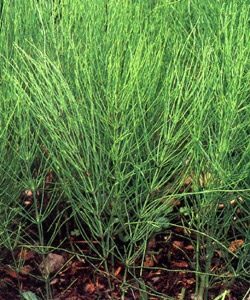 Horsetail is decocted in water (for 15-20 minutes), tinctured in alcohol or dried. This formula supplies easily assimilated minerals such as iron, calcium, silicon, magnesium, potassium, sulfur, iodine, zinc, magnesium and trace minerals. Good for deficient and anemic conditions. Simmer equal parts of: parsley, yellow dock, nettles, horsetail, comfrey root, watercress, kelp and irish moss – four ounces to a quart of water. Continue to simmer until volume of liquid is reduced by half. Strain, keep the liquid and cover the herbs with water once more; simmer again for ten minutes. Strain again and combine the two liquids. Cook this down until the volume is reduced in half. Add an equal amount of blackstrap molasses. Dosage: take one tablespoon, three to four times daily. Keep refrigerated, up to a week. Cautions/Contraindications: Horsetail must be extracted in alcohol or water and not eaten as it will cause GI irritation.